Next time you are at Starbucks picking up your coffee with a splash of soy milk - hit up the bar area for free beauty booty. 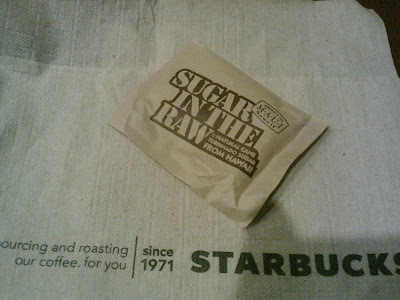 Sugar in the raw packets: there is enough sugar in one lil packet to get your lips or elbows smooth. Take it home, add a bit of olive oil or coconut oil in a bowl with the sugar and massage onto you lips or a dry spot (avoid your face - the sugar is to course for the face area). Brush off of your lips or wash it off your dry spot. Sugary and soft! Napkins: Recently I read that the napkins from Starbucks make great face blotters...I have oily skin and a few hours after putting on my makeup and running errands I can be pretty shiny. So I tried using the napkin to remove oil...It worked! It worked just as well as my pricey lil blotting sheets! Great tips! Another excellent cheap/free oil blotter sheet are those thin paper toilet seat covers. Also, in a pinch, cheap-o coffee filters themselves are awesome. ouch eating sugar plain would kill my teeth! i like rock candy in small amounts though! the toilet seat thing is something i have tried in the past as well! Good tips! Ijust ran out of Elf's blotter sheets, they were pretty good for a buck. I don't often go to Starbucks but I will try using turbinado sugar & olive oil as a gentle exfoliant. Thanks for the tip!